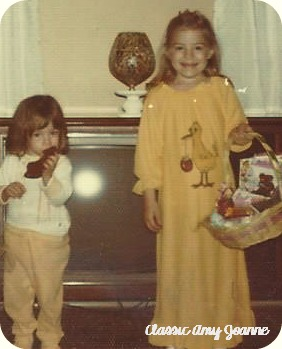 Yes that’s me, early 70’s …..and my younger sister Stacey, chomping on her Chocolate Bunny…my basket is still together and presentable, I love a good presentation…..not sure about my sister’s basket! 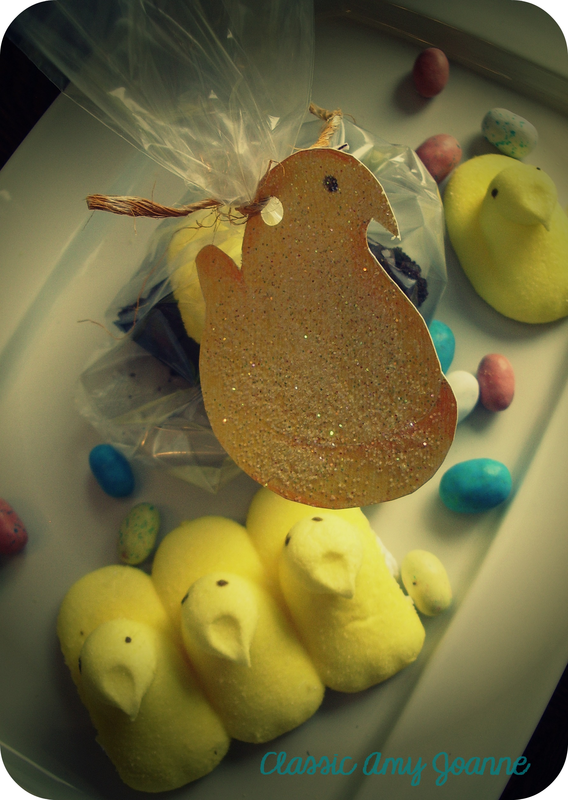 I have created to share with you a PEEP Easter gift tag to adorn a wrapped gift or Easter basket…this Easter season. I chose PEEP’s because they are a favorite candy of my husbands and they are manufactured right here in Pennsylvania….PS they have an awesome tour if you are in the area! My husband loves to poke a hole in the package of PEEPS, let them get a little hard and then eat them…..so many ways to eat a PEEP! 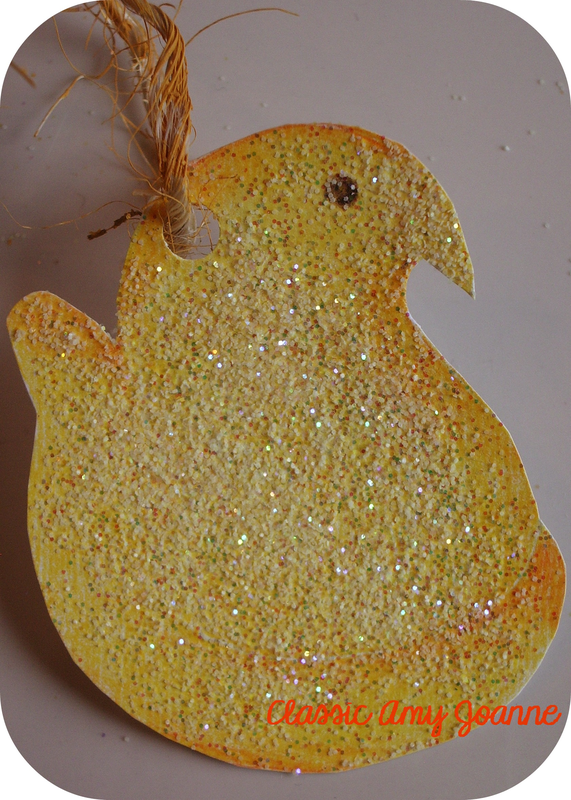 Let’s gather the supplies for the Easter gift tag…..
Cardstock, PrismaColor Colored Pencils, Scissors, Hole Punch, Brush, Twine, Paint, Glitter and Glitter Varnish. To create the Easter gift tag I ‘googled’ PEEPS, picked a PEEP line drawing to trace and then transferred the design to white card stock. I colored the PEEP with PrismaColor Colored Pencils, Sunburst Orange two or three layers. I then hi-lighted the head and body, Yellowed Orange (or any lighter color yellow). Then shade under the belly, on top of the head and tail, Orange. Burnish Sunburst Orange. Add an eye, Dark Brown. With a scissors, cut the PEEP out. 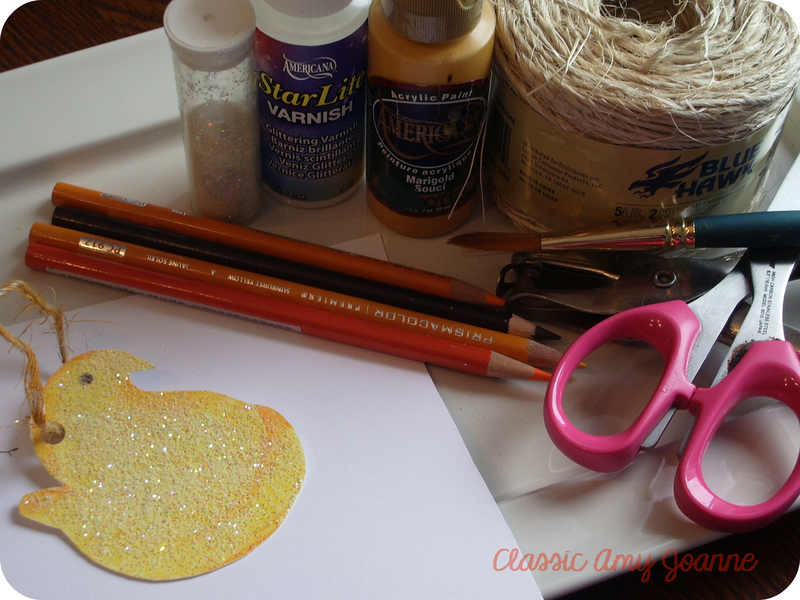 Seal the PEEP with Americana DecoArt Starlite Varnish by brushing it over the PEEP and quickly sprinkle with glitter of choice while still wet. Let Dry. With a hole punch, punch a hole thru the top. 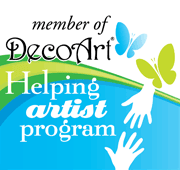 I did not have ‘yellow’ ribbon and wanted to find something around my home to use for the tie-on. 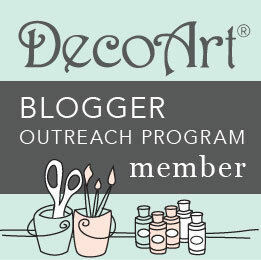 I found twine and then used DecoArt Marigold Paint to stain the twine here and there, by brushing it over twine. 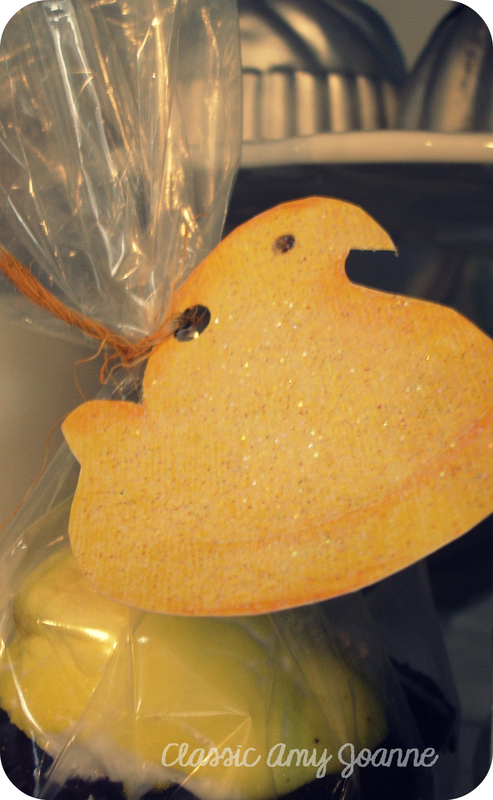 Your PEEP Easter gift tag is ready for Easter gift giving or to adorn a basket…. I love Pinterest for ideas, who doesn’t…..I searched for ideas with PEEPS….wow, so many ideas! 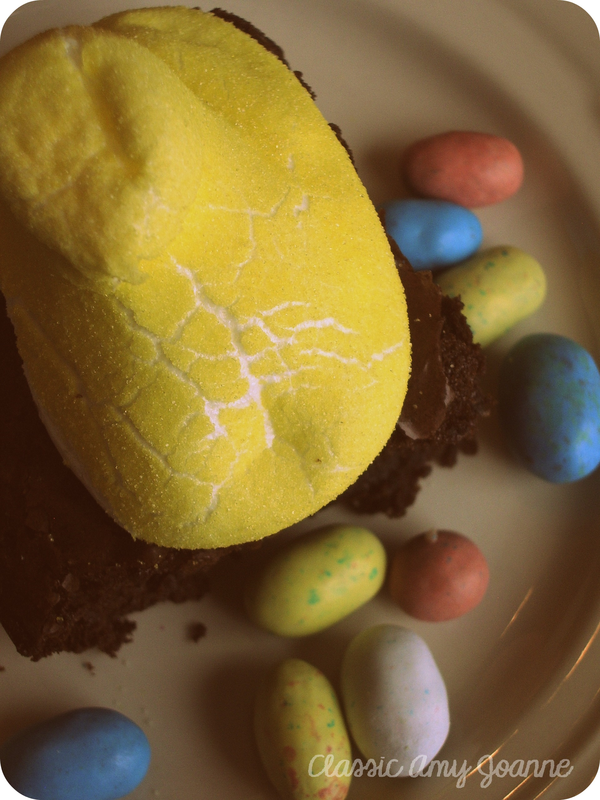 I found a cute idea to bake a batch of brownies and add PEEPS to the top when ready to serve…heat under the broiler a few minutes until the PEEP begins to melt…..ready to serve or wrap in a cello bag and add the gift tag for Easter gift giving…..
Do you have a favorite basket or gift giving idea for Easter? Hi Amy! The comment about your husband poking a hole in the PEEPS package & letting them get hard before he eats them cracked me up! My husband does the same thing. He lets them get rock hard. He actually let a package of them harden form one Easter to the next … and yes … he ate them! lol! Oh My word….year old peeps! I can’t imagine, but I am sure my husband would completely understand! Thanks for sharing Lisa! This is adorable! All my grands are grown now, but I still want to make this!! Thanks Connie…they make up really quick….young and grown ups alike will enjoy!